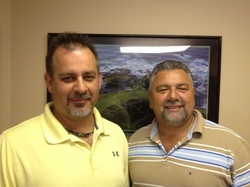 Tom Paonessa and Keith Weatherly Principals of Earth Energy Solutions have a combined 30 plus years of experience in the installation and management of geothermal systems. NCSEA spoke with Paonessa and Weatherly about the benefits of geothermal. How long has Earth Energy Solutions LLC been in business? Three months. Click here to read more about the company. What's driving the growth in North Carolina's geothermal industry? The tax incentives for geothermal. Federal is 30 percent and state is 35 percent up to $8,400. What makes geothermal energy so viable in our state? It’s cleaner, more efficient than any other heating and cooling system in today’s market. Equipment life span is approximately 18-25 years — very low maintenance costs. The average system will save 40-60 percent off of your existing heating/cooling and domestic hot water bills. Believe it or not every homeowner owns their own power plant that it is located beneath the ground on their property. We just tap into the ground to extract the heating and cooling via a closed or open loop system. Click here to see a PowerPoint presentation that will give you a better understanding of geothermal. How does a home or business owner know if he is a good candidate for installing a geothermal system? Everyone is a potential candidate. What are the benefits of using geothermal energy? Reducing carbon and fuel consumption — (It's) just clean efficient energy.